Peas (Botanical name: Pisum sativum) are one of the easiest vegetables to grow in home garden. It is known as matar, sitsaro, He lan do, Tian cui wan dou, Wan dou, Pisello mangiatutto, Saya endou, Arveja cometodo, etx. in different languages. Find below details on how to grow peas starting from seeds in pots and garden and care instructions. Peas grow well during the cooler months of the year, temperatures below 24°C (75°F). In USA, they can be grown in USDA hardiness zones 3 to 11. Peas are easy to grow, children love to grow them. 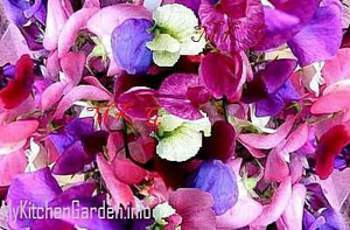 They produce very beautiful flowers that add colors to the garden.The peas have a very limited growing season. They may be planted in garden beds for a colorful display and good harvest, but you can also grow them in a large container, preferably rectangular. Following are some tips for how to grow peas for home gardeners. There are several types of peas like garden peas, green peas, field peas or soup peas (P. sativum var. ravense), flat edible-podded snow peas known as mangeout peas, sugar peas, or Chinese peas (P. sativum var macrocarpon), etc. Three types of peas can be grown in your home garden. They include sweet peas (inedible pod), snow peas (edible flat pod with small peas inside) and snap peas (edible pod with full-size peas). They come in dwarf and vine varieties. Peas need well-drained, compost-rich soil. Dig the soil well and mix lots of compost, preferably mushroom compost and some lime. Sprinkle and mix some wood ash to the soil. Do not add any manure in the soil as it can add too much nitrogen which is responsible for the weak growth of the plant. In Australia, peas can be planted from April to September. You can plant peas from late summer to late winter. Best planted at soil temperatures between 8°C and 24°C (46°F and 75°F). Peas are not grown from seedlings. Sow the seeds. Buy seeds from your local garden shop. Sow seeds in a sunny place about 1 inch deep and 2 inch apart in damp soil. Watered after sowing and then do not water again until the seeds are germinated in a couple of days. You can soak the seeds overnight in water to speed up the germination. Water regularly, but over-watering will rot the seeds and plants. However, do not let plants dry out, otherwise very less number of pods will be produced. The peas vines need support to climb when growing. I use small branches chopped from trees. You can also make a wire netting or string support between bamboo sticks or put trellis at time of planting. Generally peas don't need too much fertiliser if you have mixed compost and manure in the soil before planting. The plants sensitive to too much nitrogen, but like phosphorus and potassium. You can apply a liquid feed high in potassium like comfrey tea to increase flowering. You may give a side dressing of bone-meal for phosphorus. Aphids, Mexican bean beetles, wilt and mildew are the common problems for pea plants. For pests control, use a neem spray. To control the fungul disease, keep pea vine leaves as dry as possible. Spray leaves with a milk solution by mixing 1 part full cream milk to 9 parts water. Once the peas start growing, the question is when to harvest them? When the pods are swollen, you can harvest them. Just open a pod to see iof it ahs good peas inside. Note that the pods on the lower part of the plant mature earliest. Harvest pea pods regularly to encourage more pods to develop. Peas are crispiest in the morning after the dew has dried. So pick them in the morning. Place the peas in a paper bag and put in a plastic bag which can be frozen or kept in the refrigerator for about 5-7 days. Do not throw away the pea plants when they finish. Just dig the plants into the soil because they add nitrogen to the soil. Peas can be grown in the same bed with potatoes.